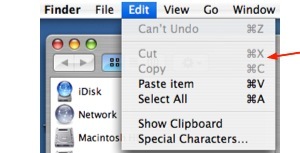 There are many ways to copy a file in OS X. 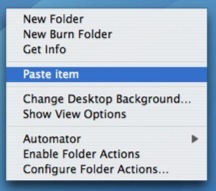 The simplest way is by control-clicking on a file (or right-clicking if you have a two-button mouse) to open up a context menu, then selecting Copy. You can then left click somewhere else in the window so that the file is no longer selected, control-click (or right-click with a mouse) , and select Paste Item. 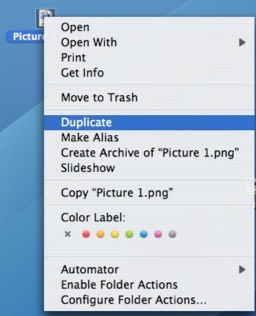 If you want to create a copy of a file or folder in the same location on your hard drive, control-click on it and then select Duplicate. You can also copy a file by using the options under the Edit menu in the Finder (Edit, Copy and Edit, Paste), or keyboard shortcuts (Control + C for Copy and Control + V for Paste). You can also hold down the Option key while dragging a file to create a copy. 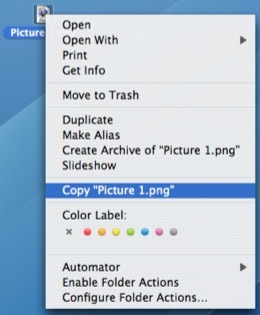 A plus sign will appear on the file’s icon as you drag it to let you know you are creating a copy.